The sanctions vs. engagement debate is heated, to say the least. But is there a middle ground? Readers of The Diplomat recently had the opportunity to observe just how brutal the debate over North Korea can get. As escapee Yeonmi Park has risen in prominence, her words have now entered into the broader discussion over the future of the country. So what context can be given to this debate which has now become so personal that people are accusing Park of being a puppet? Opinions on North Korean policy in the West break down broadly into two camps: those who favor sanctions and those who favor engagement. Each camp, in the broadest possible terms, also represents a very different idea of how North Korea can be changed for the better. Those who favor sanctions are patiently waiting for the collapse of the Kim Dynasty, whereas in the other camp, they see it as reformable or believe that Pyongyang-driven policy is key to changing things for the better. These camps are not necessarily mutually excusive but the constant battle between the two might lead one to think that they are. What is interesting is what they agree on – that is, the present policy of the United States – which probably does not help things much. 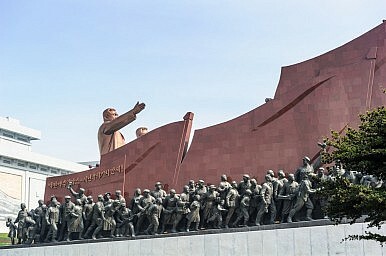 Michael Bassett, the analyst and tour guide who assailed Park to the point where she is considering leaving her job, believes that the government must be reformed from within but that as long as sanctions remain, the aggressive position of Pyongyang will never change. Thus, he draws a line between those sanctions and the unchanging status quo. Joshua Stanton, widely considered a hawk, points out that the present U.S. sanctions are not particularly strong. In light of these analyses, if one is looking for consensus, it is that the current U.S. policy is insufficient. Where both sides differ is on the subject of what to do next. Stanton supports new sanctions that will cut deeper into the regime’s finances, whereas Bassett and others such as Felix Abt (a businessman who has had substantial dealings with North Korea) and Joe Terwillager (a Columbia University professor of genetics who was involved in Dennis Rodman’s trip to North Korea) believe that the sanctions should be a preface to the opening of the country. Each of these two sides has harangued the other brutally in print to an extent very seldom seen within academia. The debate over sanctions is one that is completely irreconcilable inasmuch as they either exist in some form or they do not. As a consequence, the core discussion over the future of North Korea is easily lost between both of these sides. During my own time in North Korea, I encountered exasperated Chinese businessmen attempting to engage North Korea by dealing with the Kim family. As a group, some of them had made a profit, however this does not mean that these economic arrangements have translated into political reform. Felix Abt proves that one can make money in North Korea but making money does not mean one is changing things. The South Korean investment in Kaesong is many times larger than Abt’s own efforts and has not produced the sort of political reform preferred by the engagement crowd. Investing in North Korea through Pyongyang and the ruling class is to approach the country where the government is at its strongest and most able to resist change. In those sorts of business arrangements the government is in a position to say no and then an enterprise comes to an end – but the government does not have that sort of power everywhere. It also comes at a significant price in terms of objectivity. Abt has taken to publishing a line that is close to an apologia, while Terwillager has been featured in North Korean propaganda laughing with Kim Jong Un. The North Korean bureau of the Associated Press has faced significant criticism of how it maintains its objectivity while operating within the country. It is possible to argue that these sorts of activities produce an overall positive outcome but they do come with identifiable drawbacks. The picture is more promising when one looks to other points of evidence. There are other areas where reform is more evident, which can be found by looking at what the government has to tolerate, rather than what it has changed. The underground economy within North Korea is the product of a state system of centralization that failed. Something similar occurred with the Soviet Union. When the Soviet Union fell it had no revenue with which to pay for the massively inefficient system that the people relied upon in order to be fed. The system of food distribution broke down and, as a result, a large number of people starved to death. That system has never really been repaired and in its place a large underground economy has taken hold. In North Korea, government officials make money from bribes and trade but the investment is from the bottom up, not from top down and in spite of efforts to control these markets, they remain. As a result of these underground markets and the money they make in terms of bribes and trade the central government in Pyongyang has had to tolerate their existence; an unwilling tacit acknowledgement of its value to Pyongyang’s economy. The people of North Korea need those markets and attempting to close them down could create significant instability within the country. However, these markets are highly sensitive to interference and they are able exist mostly because the government has no choice but to tolerate them. Unless there is some other large amount of top-down revenue being injected into Pyongyang, the trend towards marketization should continue. However, if the government gains access to greater amounts of centralized resources, then it will be less dependent on those markets and could well start to push back on these changes. The sensitivity of those types of markets informs the overall debate between the sanctions and engagement crowds, and in fact points towards significant common ground. Sanctions of the right kind can ensure that the Kim dynasty never becomes wealthy enough to close the markets down, but removing them entirely could empower the Kims and make the regime less likely to tolerate change. As for engagement, pointing it towards the people of North Korea and working to empower their underground economy could allow those market forces to develop further. This combination of sanctions and support for the developing markets is perhaps the only truly different policy option that has not yet been tested, and it is one that could mobilize the two existing highly divided constituencies. Robert Potter is a PhD student at Flinders University. He was previously a visiting scholar at Columbia. Behind North Korea’s YouTube AmbitionsSouth Korean President: North Korea, US Both Need to Do MoreSeoul Is Testing US Patience Over North Korea SanctionsSouth Korean Broadcasters Change the Way They Cover North KoreaDid North Korea's Economy Actually Grow While Under Sanctions?